Not to be confused with Arecaceae or Araliaceae. The Araceae are a family of monocotyledonous flowering plants in which flowers are borne on a type of inflorescence called a spadix. 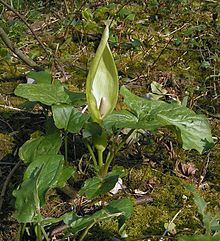 The spadix is usually accompanied by, and sometimes partially enclosed in, a spathe or leaf-like bract. Also known as the arum family, members are often colloquially known as aroids. This family of 114 genera and about 3750 known species is most diverse in the New World tropics, although also distributed in the Old World tropics and northern temperate regions. The largest collection of living Araceae is maintained at the Missouri Botanical Gardens. Another large collection of living Araceae can be found at the Munich Botanical Garden, due to the efforts of researcher and aroid authority Josef Bogner. Species in the Araceae are often rhizomatous or tuberous and are often found to contain calcium oxalate crystals or raphides. The leaves can vary considerably from species to species. 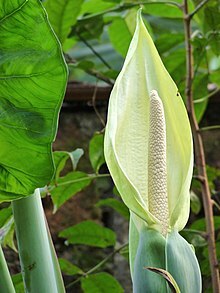 The inflorescence is composed of a spadix, which is almost always surrounded by a modified leaf called a spathe. 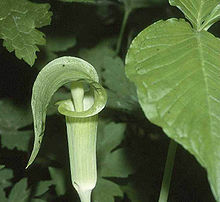 In monoecious aroids (possessing separate male and female flowers, but with both flowers present on one plant), the spadix is usually organized with female flowers towards the bottom and male flowers towards the top. In aroids with perfect flowers, the stigma is no longer receptive when the pollen is released, thus preventing self-fertilization. Some species are dioecious. Many plants in this family are thermogenic (heat-producing). Their flowers can reach up to 45 °C even when the surrounding air temperature is much lower. One reason for this unusually high temperature is to attract insects (usually beetles) to pollinate the plant, rewarding the beetles with heat energy. Another reason is to prevent tissue damage in cold regions. 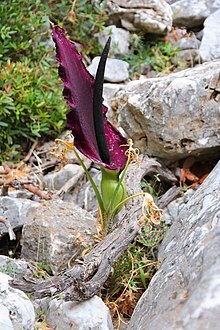 Some examples of thermogenic Araceae are: Symplocarpus foetidus (eastern skunk cabbage), Amorphophallus titanum (titan arum), Amorphophallus paeoniifolius (elephant foot yam), Helicodiceros muscivorus (dead horse arum lily), and Sauromatum venosum (voodoo lily). Species such as titan arum and the dead horse arum give off a very pungent smell, often resembling rotten flesh, to attract flies to pollinate the plant. The heat produced by the plant helps to convey the scent further. Phylogeny based on the Angiosperm Phylogeny Website. One of the earliest observations of species in the Araceae was conducted by Theophrastus in his work Enquiry into Plants. The Araceae were not recognized as a distinct group of plants until the 16th century. In 1789, Antoine Laurent de Jussieu classified all climbing aroids as Pothos and all terrestrial aroids as either Arum or Dracontium in his book Familles des Plantes. The first major system of classification for the family was produced by Heinrich Wilhelm Schott, who published Genera Aroidearum in 1858 and Prodromus Systematis Aroidearum in 1860. Schott's system was based on floral characteristics, and used a narrow conception of a genus. Adolf Engler produced a classification in 1876, which was steadily refined up to 1920. His system is significantly different from Schott's, being based more on vegetative characters and anatomy. The two systems were to some extent rivals, with Engler's having more adherents before the advent of molecular phylogenetics brought new approaches. Modern studies based on gene sequences show the Araceae (including the Lemnoideae, duckweeds) to be monophyletic, and the first diverging group within the Alismatales. The APG III system of 2009 recognizes the family, including the genera formerly segregated in the Lemnaceae. The sinking of the Lemnaceae into the Araceae is not universally accepted. For example, the 2010 New Flora of the British Isles uses a paraphyletic Araceae and a separate Lemnaceae. A comprehensive genomic study of Spirodela polyrhiza was published in February 2014. The cuckoo-pint or lords and ladies (Arum maculatum) is a common arum in British woodlands. 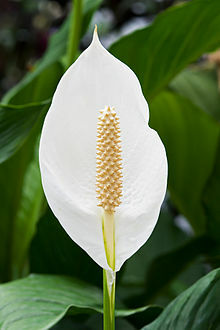 Anthurium and Zantedeschia are two well-known members of this family, as are Colocasia esculenta (taro) and Xanthosoma roseum (elephant ear or ‘ape). The largest unbranched inflorescence in the world is that of the arum Amorphophallus titanum (titan arum). The family includes many ornamental plants: Dieffenbachia, Aglaonema, Caladium, Nephthytis, and Epipremnum, to name a few. In the genus Cryptocoryne are many popular aquarium plants. Philodendron is an important plant in the ecosystems of the rainforests and is often used in home and interior decorating. Symplocarpus foetidus (skunk cabbage) is a common eastern North American species. An interesting peculiarity is that this family includes the largest unbranched inflorescence, that of the titan arum, often erroneously called the "largest flower" and the smallest flowering plant and smallest fruit, found in the duckweed, Wolffia. Within the Araceae, genera such as Alocasia, Arisaema, Caladium, Colocasia, Dieffenbachia, and Philodendron contain calcium oxalate crystals in the form of raphides. When consumed, these may cause edema, vesicle formation, and dysphagia accompanied by painful stinging and burning to the mouth and throat, with symptoms occurring for up to two weeks after ingestion. Food plants in the family Araceae include Amorphophallus paeoniifolius (elephant foot yam), Colocasia esculenta (kochu, taro, dasheen), Xanthosoma (cocoyam, tannia), Typhonium trilobatum and Monstera deliciosa (Mexican breadfruit). While the aroids are little traded, and overlooked by plant breeders to the extent that the Crop Trust calls them "orphan crops", they are widely grown and are important in subsistence agriculture and in local markets. The main food product is the corm, which is high in starch; leaves and flowers also find culinary use. ^ Bogner, Josef; Johnson, Kirk R.; Kvacek, Zlatko; Upchurch, Garland R. Jr (2007). "New fossil leaves of Araceae from the Late Cretaceous and Paleogene of western North America". Zitteliana. 47: 133–147. ^ "Araceae in Flora of North America @ efloras.org". Efloras.org. Retrieved 17 January 2014. ^ "Araceae - Encyclopedia of House Plants". gflora.com. Retrieved 17 January 2014. ^ "Araceae - Flowering Plant Families, UH Botany". University of Hawaii. Retrieved 17 January 2014. ^ "Araceae" (PDF). Iowa State University. Retrieved 17 January 2014. ^ Korotkova, Nadja; Barthlott, Wilhelm (2009). "On the thermogenesis of the Titan arum (Amorphophallus titanum)". Plant Signaling & Behavior. 4 (11): 1096–1098. doi:10.4161/psb.4.11.9872. PMC 2819525. ^ Stevens, P.F. (2001). "Araceae". Angiosperm Phylogeny Website. 13. Retrieved 30 December 2017. ^ Bown, Deni (2000). Aroids: plants of the Arum family. Timber Press. p. 46. ISBN 0881924857. ^ Stevens, P.F. "Araceae". Angiosperm Phylogeny Website. ^ Angiosperm Phylogeny Group III (2009). "An update of the Angiosperm Phylogeny Group classification for the orders and families of flowering plants: APG III". Botanical Journal of the Linnean Society. 161 (2): 105–121. doi:10.1111/j.1095-8339.2009.00996.x. ^ Stace, Clive (2010), New Flora of the British Isles (3rd ed. ), Cambridge, UK: Cambridge University Press, ISBN 978-0-521-70772-5 pp. 830–834. ^ Wang, W.; Haberer, G.; Gundlach, H.; Gläßer, C.; Nussbaumer, T.; Luo, M. C.; Lomsadze, A.; Borodovsky, M.; Kerstetter, R. A.; Shanklin, J.; Byrant, D. W.; Mockler, T. C.; Appenroth, K. J.; Grimwood, J.; Jenkins, J.; Chow, J.; Choi, C.; Adam, C.; Cao, X.-H.; Fuchs, J.; Schubert, I.; Rokhsar, D.; Schmutz, J.; Michael, T. P.; Mayer, K. F. X.; Messing, J (2014). "The Spirodela polyrhiza genome reveals insights into its neotenous reduction fast growth and aquatic lifestyle". Nature Communications. 5: 3311. doi:10.1038/ncomms4311. PMID 24548928. ^ a b "Titan Arum FAQs | Biological Sciences Greenhouse". Ohio State University. Retrieved 17 January 2014. ^ "Aquarium Cryptocoryne Plants". Aquarium Fish International. Retrieved 17 January 2014. ^ "What is the smallest flower in the world?". Library of Congress. Retrieved 17 January 2014. ^ Watson, John T.; Jones, Roderick C.; Siston, Alicia M.; Diaz, Pamela S.; Gerber, Susan I.; Crowe, John B.; Satzger, R. Duane (2005). "Outbreak of Food-borne Illness Associated with Plant Material Containing Raphides". Clinical Toxicology. 43 (1): 17–21. doi:10.1081/CLT-44721. ^ "Aroids. Colocasia Xanthosoma". The Crop Trust. Retrieved 2019-04-06.